Check out our latest infographic: Ignore These Common Warning & Regulatory Traffic Signs At Your Own Risk. Full transcript below. Ignore These Common Warning & Regulatory Traffic Signs At Your Own Risk. Automobile accidents are caused by a variety of factors including poor roadway conditions, distracted driving, driving under the influence and more. Yet one important way motorists can reduce their chances of getting into car accidents is by heeding posted traffic signs. They are big, red, and bold for a reason. Yet every year, drivers who ignore STOP Signs account for one-third of intersection crashes - With more than 40% of them being fatal. STOP Signs hiding behind overgrown trees or shrubs may be to blame for a small portion of these accidents. However, the vast majority of them are due to overlooking the signs as a result of fatigue or being distracted - Such as by texting. 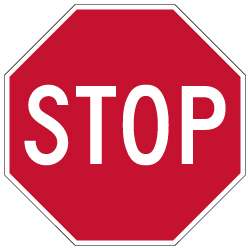 In 2012, the MUTCD revised its standards for sign retroreflectivity making STOP Signs more visible at night, the time when drivers are three times more likely to get into an accident. Misreading, or improperly heeding a Traffic Yield Sign, accounts for a large number of accidents on the road as well. More so than other signs, the Traffic Yield Sign is one of the more commonly misunderstood road signs due to many drivers not understanding right-of-way rules of the road. When faced with a Yield Sign, drivers should slow down and look carefully in the direction of the traffic that has the right of way and stop if necessary. They should take care not to underestimate the speed of other cars on the road as this is suspected to be a major cause of accidents. Motorists who speed and ignore posted speed limit signs put themselves and others on the road at risk of accident and serious injury. Drivers who overlook advisory speed limit signs by driving too fast account for nearly one-third of all fatal crashes. For instance in 2011, out of more than 32,000 fatal crashes, almost 10,000 of them were related to driving at excessive speeds. Whether they are in a hurry or are driving fast for the thrill of it, speeding is highly related to increased rate of automobile accidents and fatalities. In other words, if a driver gets into an accident while speeding, that accident is more likely to be fatal than if that driver gets into an accident driving at the posted speed limit sign. Depending on the climate and terrain, there are a wide range of roadway warning signage such as “Slippery When Wet,” “Curves Head,” or “Sharp Turn Ahead” and much more. Such traffic warning signs may be spelled out using words or displayed using a standard pictorial drawing. These signs may have two meanings; curves head signage essentially should also be read as a caution, slow down sign. A traffic warning sign may be misunderstood if it is unfamiliar to the driver but he or she is still responsible for correctly abiding by it. Accidents involving wrong way driving, whether on a busy city street or on the entrance to a fast-moving highway, tend to be serious or fatal as they often involve head-on collisions. The vast majority of wrong way driving involves not properly reading or comprehending the posted One Way Signs or Do Not Enter Signs due to driver impairment by use of alcohol. In addition, most of these accidents occur at night when visibility of such road signs is reduced. Accidents involving pedestrians account for about 12% of all traffic related deaths per year with the elderly and children being especially vulnerable. Obeying pedestrian crossing signs, particularly school crossing signs, can help prevent serious injury and even death. By taking the time to slow down and look behind them and all around, motorists can reduce such occurrences. As with other accidents, speed can play a crucial role in determining whether an accident leads to a fatal outcome. Drivers can reach their destination safely – and avoid getting a ticket -- by taking the time to follow posted traffic signs. Even though drivers might not think about it, these signs are posted to enhance the safety and well being of drivers, passengers, bicyclists and pedestrians alike. Such signage has proven to be effective, yet they only work when all drivers adhere to them. Wherever you drive you are sure to see these familiar traffic signs helping you stay safe. STOPSignsAndMore.com manufactures these signs and other common road way signs in their warehouse in Carlsbad, CA. All signs are made in the USA and available for purchase directly from their secure website. Made of durable aluminum, these signs can withstand the harshest weather conditions and are MUTCD approved. Visit their website: at StopSignsAndMore.com to learn more.